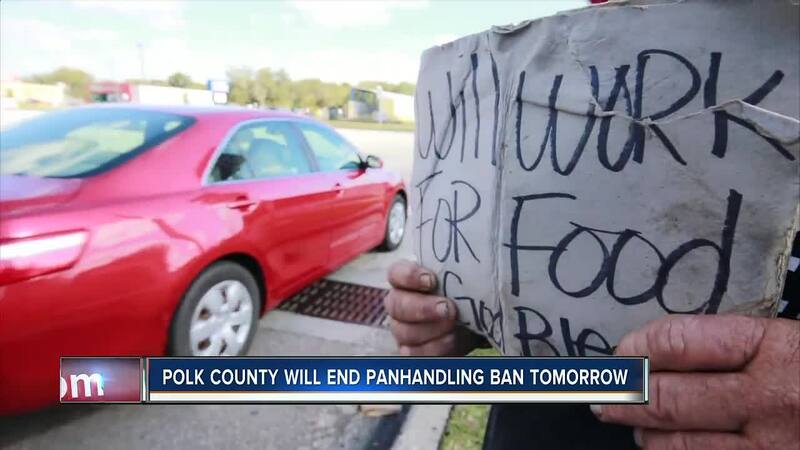 Polk County Commissioners say on Tuesday they will repeal an ordinance that bans panhandling. BARTOW, Fla. — Polk County leaders are taking a dramatic step in order to protect themselves and the county. Commissioners say on Tuesday they will repeal an ordinance that bans panhandling. In fact, board members say legally, it shouldn’t have been a law in the first place. “It’s rough out here,” Phillip Hawkins Jr. says. He’s spent the last month out on the streets after he was kicked out of his home. Since then, Hawkins has been walking the streets in Lakeland asking others for either food or money. Hawkins says it’s his last resort for help. “It’s hard out here for the homeless,” he said. What’s harder, he told ABC Action News, is the fear of police around every corner. Today, an ordinance is still in place outlawing panhandling. “Just ask them for something to eat, yeah they’ll put you in jail,” Hawkins said. He tells us he has been arrested at least 10 times for asking the public for money. Commissioners say the ordinance was originally put in place at the suggestion of Polk County Sheriff, Grady Judd in order to curb traffic hazards. But now, after several lawsuits across the country arguing that banning people from asking for money is unconstitutional, the board has decided to take action. On Tuesday, commissioner George Lindsey says he and the other members plan on repealing the ordinance in order to skirt any legal responsibility to those who may be ticketed for soliciting. Drivers say they’re glad the homeless won’t get in trouble for asking for help, as long as they’re polite about it. “As long as they are not getting physically too close to you or anything,” Bonnie Alexander said. According to the Polk County Sheriff’s Office, there were only seven tickets for solicitation given in 2018, but there were 492 calls for service for panhandling in which warnings were most likely given. This year though, there will be zero, a way of protecting the county from any litigation. In Tampa, there is an ordinance against aggressive panhandling or asking for money while standing in a road. Three years ago city leaders wanted to pass an ordinance banning people from begging for money in downtown Tampa and Ybor City but a federal judge declared it unconstitutional.